In light of this week’s revelations about the sugar industry paying Harvard University researchers to exonerate sugar’s role in increasing coronary artery disease risk, we want to point out that The Sugar Association always has a booth at the Academy of Nutrition and Dietetics’ conference expo. 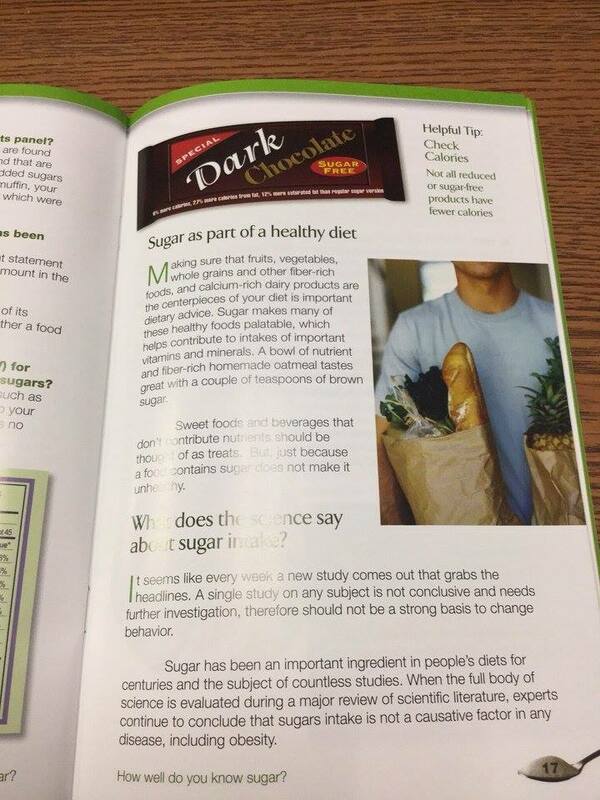 The accompanying photograph is one page of an “educational pamphlet” The Sugar Association distributed to dietitians last year. Among the claims: sugar makes fruits, vegetables, and whole grains palatable (is a banana not palatable enough?) and sugar is not a causative factor in any disease. Newer research continues to chip away at the latter statement. More importantly, this demonstrates why industry is so keen to fund and sway nutrition research. With the right tinkering, industry is able to craft results that allow it to communicate to health professionals that the (bought) science is on its side. While we’re at it, we suggest AND leadership draft guidelines relating to expo attendance. The Sugar Association has no place at a health conference.